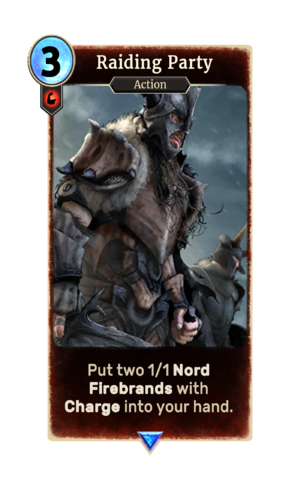 Put two 1/1 Nord Firebrands with Charge into your hand. Raiding Party is a rare Strength action card. It is part of the Core Set. In addition to the card's availability in the Core Set, two copies are included in the Redoran Onslaught theme deck, and one copy in the Hlaalu Schemes theme deck. The card's art depicts two warriors clad in Skyrim's Dragonplate Armor.